Although roughly ninety percent of DB2 Universal Database (UDB) on distributed platforms is common code, IBM makes great efforts to exploit the features of each operating system to which it ports; and on Windows, this is no exception. Clearly, the first database product certified for Windows 2000 makes use of more features in the Windows operating system than any other database on the market today and delivers world class record setting price performance. 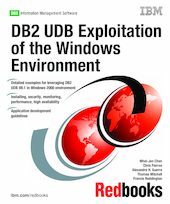 This IBM Redbooks publication is an informative guide that describes how to effectively implement DB2 UDB V8.1 with Microsoft Windows 2000 operating systems. It is intended for anyone who needs both an introduction and detailed information on installing, configuring, and managing DB2 UDB on Windows. We begin by exploring the DB2 UDB product family. We cover installation procedures for interactive, unattended, and enterprise deployment. We describe DB2 UDB integration with the Windows domain security model. We discuss system and database performance factors and how to optimize and monitor them as well. We walk you through high availability features including standby and clustered servers. We discuss application development from a DB2 UDB and Windows perspective, providing general tips on building applications and cover integration of the Microsoft development tools.